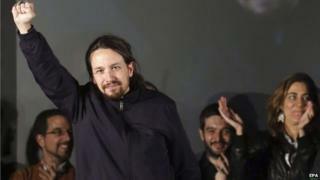 Spain's anti-austerity Podemos movement has vowed to defeat the governing Popular Party (PP) in national polls this year, after its dramatic gains in Sunday's local and regional elections. The leftist movement's leader, Pablo Iglesias, said the result spelt the end of traditional politics in Spain, which has been dominated by two parties. Podemos-backed candidates in Barcelona and Madrid both fared strongly. The PP suffered heavy losses, amid voter discontent over economic policy. With the count almost completed, the party of Prime Minister Mariano Rajoy won the most votes nationwide - 27%. Its traditional rival, the Socialists (PSOE), came second. But the two parties fell short of overall majorities in many areas that they have governed, losing ground to Podemos and to the party Ciudadanos, which campaigned on a pro-business platform. Mr Iglesias said the PP and PSOE "have had one of the worst results in their history". Anti-eviction activist Ada Colau, who is supported by Podemos, won the most votes in the mayoral race for Barcelona, Spain's second largest city. "I want to be a mayor at the service of the people, so there will never again be first-class citizens and second-class citizens in this town," she said, as quoted by El Pais newspaper. Anti-austerity parties, linked to the Podemos movement on the far left, which is barely one year old, have the prestige of holding power in Barcelona, and could form a coalition to rule in the Spanish capital. Across the country the ruling Popular Party of Prime Minister Mariano Rajoy has been punished. The PP will hold on to the fact that they still have the highest share of the vote of any single party. However, they have lost absolute majorities in regional parliaments across the country, including in traditional heartlands like Valencia, where the party has been badly damaged by corruption. Barcelona in itself is an incredible story. The new mayor will be Ada Colau, a woman who made her name by campaigning for people who couldn't pay their mortgages, and who faced eviction by the banks after Spain's construction bubble burst. The PP suffered heavy losses in its stronghold, Madrid. It may lose control of the city council if the Podemos-backed candidate, who came a close second in the city, can form a coalition with PSOE, which came third there. Analysts say that similar deals could take place in a number of councils such as Valencia, further eroding the local power of the PP. The governing party may also need to make pacts of its own with the Citizens (Ciudadanos) party in places such as Murcia and La Rioja. Spain is unfamiliar with governing coalitions as the PP and the Socialists have dominated for decades. The Spanish economy has been a key concern for voters. It has now officially come out of recession but is still grappling with high unemployment. Many voters are also furious over public spending cuts and reports of political corruption. The PP and PSOE, which preceded it in government, have both been blamed. Parliamentary elections are due to be held around November.